Travelers, worry no more! Here is a chance to get affordable fares for your flights in the next 5 months. Here are promo fares for May to September 2018 trips to local and international destinations! Cebu Pacific sale tickets from Manila to Philippine domestic destination start at P1,299 ALL IN fare. International promo fares of Cebu Pacific cost as low as P1,599. This seat sale features cheap tickets from Manila and vice versa. Quoted tickets are good for one-way travel. However, promo fares for return flights also available depending on the availability of sale tickets for your route and travel date. Take note that Cebu Pacific promos are limited and may not be up for booking on all flights. Travel dates for the Cebu Pacific promos include the months of May, June, July, August and September 2018. There are several ways of availing the Cebu Pacific promos. For one, you can log-on to the airline’s website: www.cebupacificair.com and book ticket online without using a promo code. Need help in online booking? 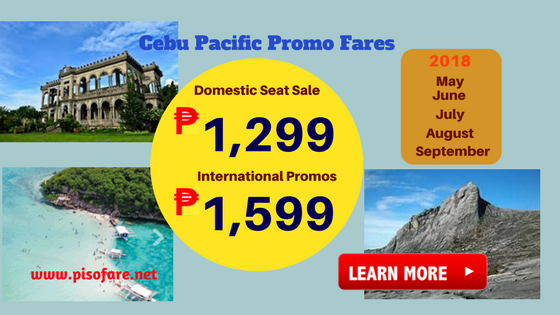 Read Guide on How to Book Cebu Pacific Promos Online. Another way of availing the low fares is by buying ticket directly at Cebu Pacific ticket offices in Luzon, Metro Manila, Visayas and Mindanao. You may also purchase ticket at accredited travel agents and ticket booking offices nearest you. Another option would be to call Cebu Pacific hotline numbers in Manila: (02) 702 0888 or in Cebu (032) 230 8888. With the many options to obtain the Cebu Pacific promos, you can surely get cheap flights to your desired vacation getaway! Popular Philippine tourist destinations as well international travel hubs are beckoning you to visit them. Book or buy ticket now to enjoy summer and the succeeding months. As in all sale, Cebu Pacific promo fares have limited availability. First Come! First Serve basis! Want to get promo updates? Like our Facebook: PISO FARE TICKET to receive promo and travel sale announcement in your newsfeed!